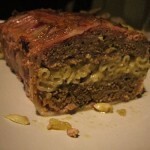 Rulada de Carne Tocata Umpluta cu Macaroane is a Romanian food recipe for a meat loaf stuffed with macaroni. Soak crumbled bread slice in 1 tbsp water then squeeze dry. Mix meat with onions, bread, bacon, salt, and pepper. Mix in parsley and dill and 1 egg. Set aside. Boil the macaroni in salt water until al dente. Rinse with cold water and drain. Mix macaroni with most of remaining egg (leave about 2 tablespoons for glazing later), pepper, and butter. Lay a large sheet of foil or plastic wrap (about 20 inches long) on your working surface or table. Spread the meat mixture on the foil in a 1⁄2-inch-thick rectangle, its length three times its width. 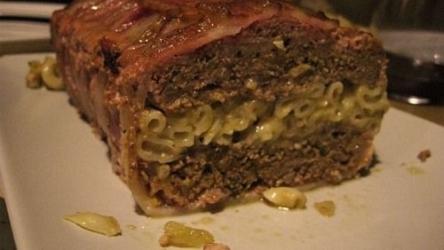 Lay the macaroni in the middle of the meat mixture leaving a wide margin. Roll meat up using the foil, to completely enclose the macaroni with the meat. Place the rolled meat loaf on a greased baking sheet. Brush with remaining egg, then sprinkle with bread crumbs. Bake in a 350F oven for 40–60 minutes, or until done then cut into 2-inch slices.